It’s early in the morning on the 18th of October. In just a short while, all five of the climbing members of this team will be moving through the Khumbu Icefall once again, headed to Camp 2. This trip up is going to be our summit attempt, weather permitting. It’s a pretty exciting time. There’s only about a quarter moon in the sky this morning, but it’s still a perfect light all around. I don’t need a light to dial the satellite phone or even to read notes I’ve written to myself. 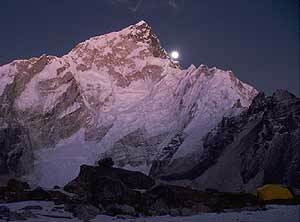 Pumori, the west shoulder of Everest, Nuptse, the peaks down valley and the other now very familiar sites about Base Camp are about me in the early morning air still and are brilliant. Yesterday, our last day at Base Camp before the summit attempt, was sunny. There were throngs of trekkers coming in to Base Camp. Maegan was in her usual position  smiling and very graciously offering interviews and anecdotes and perceptions about her goals this year. She talks in great detail with interested trekkers  they’ve all heard about her, of course, before they come up the Valley  about the route she plans to ski and her strategy. She said when we started over a year ago when we got this project going that she hopes to be an inspiration to others, especially to young women. And that spirit is still with her as we go into the final days of this expedition. 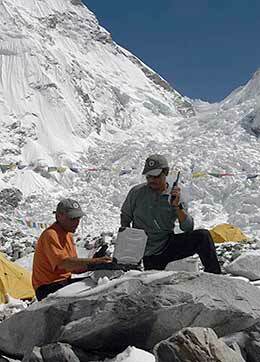 For a third consecutive day, the Sherpas were at the South Col yesterday. Forty-one bottles of oxygen have been moved up there, as well as tents, which of course are not put up yet because if the winds pick up we don’t want to loose them. But we’re getting that Camp 4 stocked pretty well. So, things are falling into place, slowly but surely. [inaudible] We’ve been sharing stories about the adventures we had from our trip down the valley. We can bond about the adventure ahead and as always, with this group of five climbers, we can enjoy one another’s company and camaraderie as we move up for what well may be our summit attempt in just a few days, possibly the 22nd.